Metal Shell for Excellent Quality: The middle bezel is made from tough anti-shock and pressure-resistant zinc alloy. The aluminium shell is light, tough and corrosion resistant. ★ ★ ★ ​AGPTEK IMP adopts Metal shell to provide a nice solid feel. The middle bezel is made from tough anti-shock and pressure-resistant zinc alloy. The aluminium shell is light, tough and corrosion resistant.You can insert your micro SD card via the card slot. Up to 64GB available. Support various lossless sound formats: MP3/APE/WAV/FLAC. Reappear the music spot as if you were really on the scene. Enjoy your massive lossless music with IMP. High quality audio decoding IC. Four-layer immersion gold board ensures that the componets and PCB board good connect and high efficiency transmission.AGPTEK IMP immerses yourself in the lossless sound. Designed with 7 Touch Buttons and independent volume control make it so easy to operate. Fashion and Easy Operation. High quality alimunum alloy casing, corrrosion resistance , light weight.​The middle bezel is made from tough anti-shock and pressure-resistant zinc alloy. The aluminium shell is light, tough and corrosion resistant. 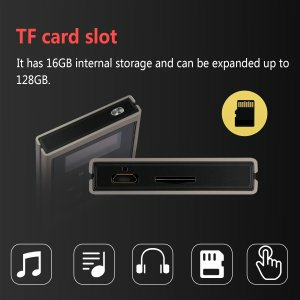 This player allows to play music for 20 hours after charged for only 1.5 hour.It has 16G internal storage (can store 8000+ songs) and can be expanded up to 64G (can store 3,2000+ songs) with TF card slot built-in. Four-layer immersion gold board.to ensure that the components and PCB board hoog connect and high efficiency transmission. Supports MP3/APE/WAV/FLAC. Reappear the music spot as if you were really on the scene. 7 capacitance touch buttons and independent volume control make it so easy to operate. 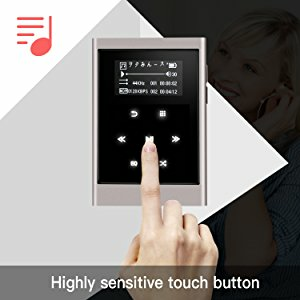 Metal shell makes this mp3 player a unique touching sense and not easy to slide. and providing Hi-fi class sound that is close to the original. IMP allows you to enjoy almost all kinds of audio since it support various popular audio formats. 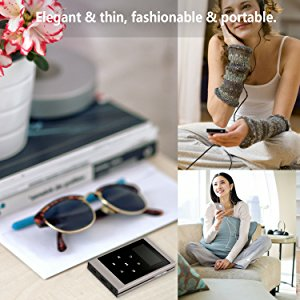 Excellent Sound Quality, Support Audio Formats: MP3/APE/WAV/FLAC.It provides Hi-Fi class music playing experience. 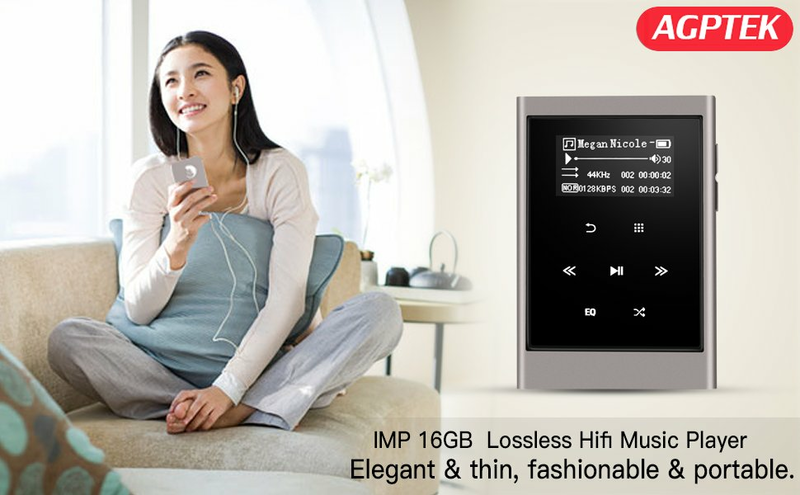 IMP has 16 GB (8000+ songs )internal memory with a card slot built-in. 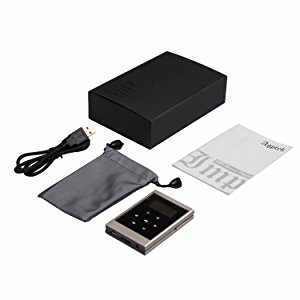 You can insert your micro sd card to expand the memory. Up to 64GB is supported. You can store your podcasts, massive lossless music. Never worry about the storage. ❤ Note: No micro SD card included. To avoid incompatibility, AGPTEK micro sd card is recommended. lossless player as well as a sports partner. 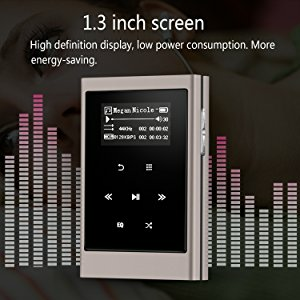 Enjoy your high quality music in any way you like. High performance ,extremelly low power comsumption. music for 20 hours after charged for only 1.5 hour.